Does IBM's Big Red Hat Buy Put Its Dividend at Risk? Shares of IBM (NYSE:IBM) have performed poorly this year, shedding more than 22% of their value since the start of the year. As a result of that large decline, the company's dividend yield now sits at 5.25%, which is quite generous compared to the yields of many other tech stocks. On Oct. 28, IBM announced it had inked a deal to buy open-source enterprise software specialist Red Hat (NYSE:RHT) at an enterprise value of $34 billion. The press release stated that IBM "intends to close the transaction through a combination of cash and debt." Red Hat CEO Jim Whitehurst with IBM CEO Ginni Rometty. Image source: IBM. Shortly after the deal was announced, commentators suggested that this deal could put the company's dividend at risk. Here's why that won't be the case. Right off the bat, the press release asserts that this deal "will support a solid and growing dividend." It's clear that IBM doesn't intend to sacrifice its dividend to complete the transaction. Dividends are generally paid from the free cash flow that a company generates. So as long as IBM continues to generate enough cash to comfortably support its current dividend payments, investors shouldn't worry about the dividend getting cut or suspended, with one caveat which we'll look at below. 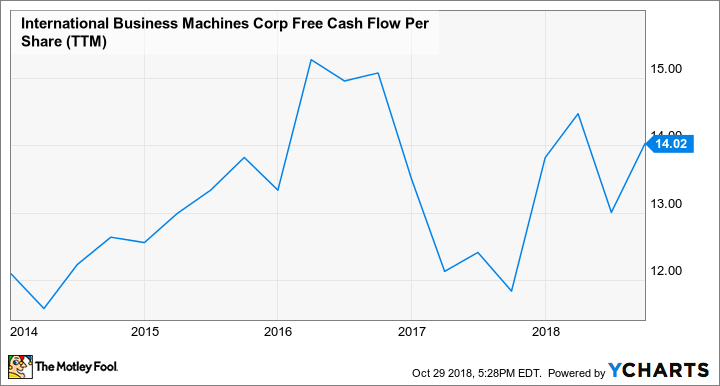 IBM Free Cash Flow Per Share (TTM) data by YCharts. The caveat to consider is that free cash flow is also used for the servicing of debt, which can eat into dividend-paying potential if it rises too quickly. However, IBM's borrowings to finance the Red Hat transaction are unlikely to push its leverage and associated debt payments to a level that would endanger its dividend. In its press release, IBM stated that it will "target a leverage profile consistent with a mid to high single A credit rating." In other words, the company isn't going to overextend itself to close this deal, and will shoot for a sustainable mix of cash and debt to acquire Red Hat's stock. It's also worth pointing out that IBM expects this deal to "accelerate IBM's revenue growth, gross margin and free cash flow within 12 months of closing." 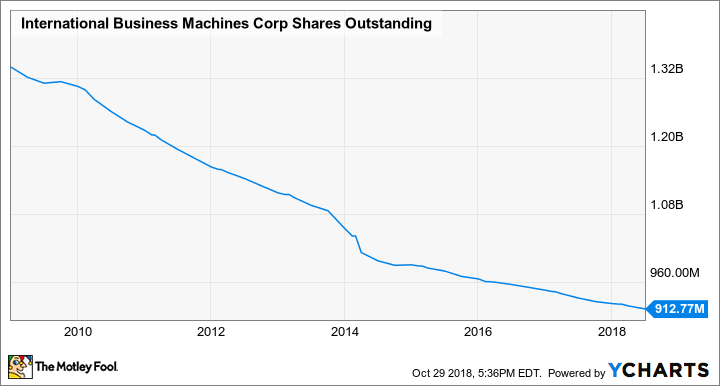 While the dividend isn't getting cut, the company did say that it "intends to suspend its share repurchase program in 2020 and 2021." IBM Shares Outstanding data by YCharts. The company's statement on the quality leverage profile it intends to maintain also applies here. Instead of buying back shares, it looks like IBM will be using its excess cash to pay down debt. Companies ultimately need to decide the best uses for the free cash flows they generate. It would appear that IBM management believes it can deliver more value for its shareholders by buying Red Hat and shutting off its buyback program for two years, rather than not buying Red Hat and continuing to buy back stock. Since the Red Hat deal isn't expected to close until the latter half of 2019, it will be a while before investors will be able to determine whether this acquisition was the best use of the company's capital.